A week prior to my trip to Bella, I read a book of Mr. Nadeem Ahsaan published by Sanga-e-Meel. I found out about the lost history of Bella in that book. While going through it, i decided to visit the city of Bella in Balochistan. I planned a trip to visit this historical place along with my family and departed on February 26, 2017. Coupled with this trip, was my 20th wedding anniversary and what could have been a better gift then a trip to this place to my beloved wife. We departed from our house at 8am with all the necessary packed things inside the car. Kids were excited to reach the destination. Bella is around 185km away from Karachi and the route to reach there is through Hub River Road. The drive was very smooth with safe roads and you could enjoy breakfast and other meals on the side way restaurants and Dhabbas. The first city we came across was Hub city, then came Winder, then Uthal. After Uthal, at about 55km further we finally entered the historic city of Bella. We stopped at a road side cafe in Bella, enjoyed their traditional Kahwa with andaa paratha (Half Fried Egg). Apart from this, other cuisines were also available like channa curry, chicken karhai etc. We took trip advice from the cafe owner but he wasnt aware of the historical sites and suggested us to inquire from within the city. Prior to enter the city of Bella, make sure you are on the right path as another left turn goes to Quetta. An arch like gate welcomes the Bella visitors. Even in the city, very few people were aware of the sight seeing of historical places like the Historical Mosque. Infact Google played a vital role along with some directions from the locals to reach to the historical mosque. That mosque is known as "Jamia Masjid Qadeemi-Bella". Colored with white paint and decorated with Islamic calligraphy on the tomb in a medium sized mosque. It was built in 1929 by the princely state of Lasbella headed by Jam's tribe. After visiting this mosque, we were thinking of whom to ask for further visits. Upon inquiry from a medium aged man about the tomb of Ibn-e-Haroon, we were relaxed as the local did know about its location. So we followed him to the destination. The middle aged man spoke to the old guard of the tomb and he then invited us inside for the visit. Four graves inside the tomb welcomed us and among those, the biggest grave was of Mohammed Bin Haroon, a muslim General of Arabian army around the 8th century. Muhammad Bin Haroon, was the one who made his marks on the Makran Coast. Mohammad bin haroon preceded the famous muslim conqueror of Sindh, Mohammad bin Qasim to this area. Governor Hajjaj bin Yousuf sent the army under Muhammad Bin Qasim, who first arrived in Makran, was welcomed by Muhammad Bin Haroon and they together set out in the direction of Armanbela (BELA). Due to illness and bad health he could not joined the army of Mohammad bin Qasim. He died in Bella where his tomb is situated. He was among the Taba Al Tabieen. After visiting his tomb, we inquired about the grave of Robert Sundeman and acknowledged his grave was around 10 min drive. So he took us there. That particular area is famous to be known as Sundeman. Near to his grave, the famous landmark is the presence of Babri Masjid (Local one). He is rested ina tomb at a corner of a large ground. Once there used to be a park whose sights were not visible to date. Robert's grave was topped with granite slab which had a graved plate on it with its description. Regretfully, the plate was so ill maintained and covered with dust and disgusting spits of paan that my children washed it to make it seen. He was a British Political Agent to the Governor General of Baluchistan. In December 1876 an agreement was signed between Sundeman and Mir Khudadad khan, the Khan of Kalat and Jam Ali Khan of Bela. After the death of Jam Mir Khan his eldest son Jam Ali khan was appointed in Bela by Sir Robert Sundeman. He died in 29th January 1892 in Bela, where he was buried and a tomb made over his grave which still reminds the days of British Supremacy. To the courtesy of that middle aged man, his name was Naseer Ahmed Jaan, he offered us a great hospitality to have lunch at his place. Since we had to move ahead with our visits, we appreciated his hospitality and decided to move ahead with our planned visits. He then sent his son to guide us through the other sites. Our next destination was Bara Baagh Cemetery. It was located at a distance of 8km from here. His son whose name was Yasir Ahmed Jaan, took us to that cemetery. It was indeed difficult to reach to this place without the help of his son since it was located at an uneasy place. We saw all the old graves of Jam tribe. The grave of all the dignitaries of Jam tribe still exist there along with the grave of Jam Yousuf Ali, the former CM of Balochistan. Bara Bagh cemetery, Graves of Jam's in Bela - Baluchistan. 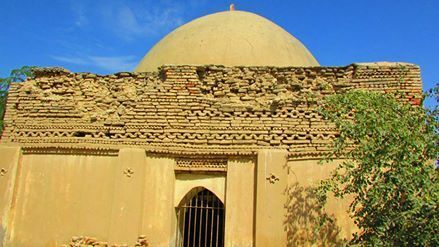 Bara Bagh Cemetery, Lasbela is an ancient cemetery of the Jams of Lasbela of the Lasbela princely state, containing more than 100 graves of which 40 belong to the Jams. After leaving this place, we entered the Jam House in the Bella city. After seeking permission from the caretakers, we entered the Jam House and visited the place. We were offered lunch over there. We thanked them, took a trip of the house and departed from there. It was built in 1929 by the then Lord of Jam's tribe. Near to this place, was the Jam's Jirga House which was also built in 1929 and now it has been converted into DC house. Our visit ended here and it will consume around 3 hrs to visit all these places. We then thanked that person and his father who escorted us to all these places. Without them, this wouldn't have been possible. I offered my number to them and extended my invitation to visit Karachi and allow us an opportunity to host them in Karachi. We left Bella city at 2pm and reached Karachi at around 5pm. The total expense of this trip was around Rs. 10,000 for 5 person's family.